Since 1991, I have designed over 45 new courses and renovated over 60. 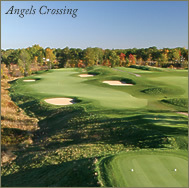 I am widely recognized for my ability to design an upscale golf course for an affordable price. While this is a slight hindrance in fame and fortune, it is very satisfying to help others. My designs reflect a lifetime in golf. I have experienced and know all facets of the golf course business. I have been a superintendent for public and high end private clubs and I have operated a public course for profit. These experiences influence how I design a course. Challenging and beautiful golf courses can still be efficient to build and operate. I utilize careful stewardship of resources to further the game of golf in challenging times. Please feel free to read more about my design philosophy, as well as my family's history in the golf business. You can also get a look into the design process, as well as browse my portfolio and photo gallery of original courses and renovation projects. 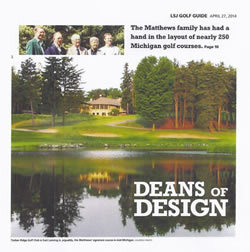 The Matthews family has been immersed in all facets of the game for golf for ninety years. The family history was highlighted by a nice article in the Lansing State Journal recently. Watermark Country Club, Grand Rapids has expanded the clubhouse and outdoor special use area to meet demands of the members and patrons. 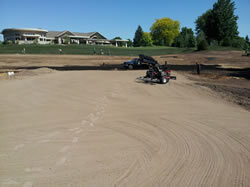 The short game area, waterfalls and formal event area project is being overseen by superintendent, Steve Tedhams. 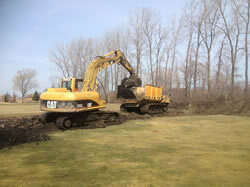 Rochester Place Golf Club, Belle River, Ontario was recently purchased by Paul St. Pierre. He has major plans for the course increasing the challenge for the better golfer with a greater variety of shot values. The planned renovations also incorporate the changing golf trends as the casual golfer is provided a highly valued experience. With an eye to the future, the construction is guided by Guy St Pierre.